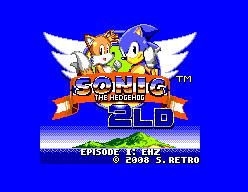 Sonic 2 LD (formerly Project H') is an episodic, in-progress hack of Sonic 2 for the Master System. The aim of the hack is to create a true Master System port of the 16-bit Mega Drive Sonic the Hedgehog 2 using the engine of the 8-bit version. Originally the hack was known as Project H' and The Hybridisation Project Mark II, named as a nod to Doc Eggfan’s original hack which aimed to do the opposite. The name was then changed to Sonic 2 LD (Low Definition) as a parody of the Sonic 2 HD community project. The project was started by Dr. Eggfan, and quickly began to get art, music and programming contributions from several other sceners. Most notably, then newcomer, Glitch, who has since gone on to make various breakthroughs in hacking the Aspect sonic engine, including programming in Spin Dash and various enemies from the 16 bit version of the game. This page was last edited on 15 April 2018, at 14:27.